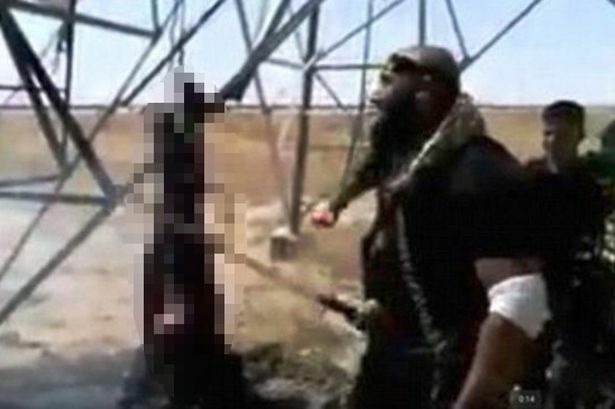 A captured ISIS terrorist was suspended over a fire, burned to death and then sliced up like a KEBAB by a rebel fighter nicknamed the ‘Angel of Death’. 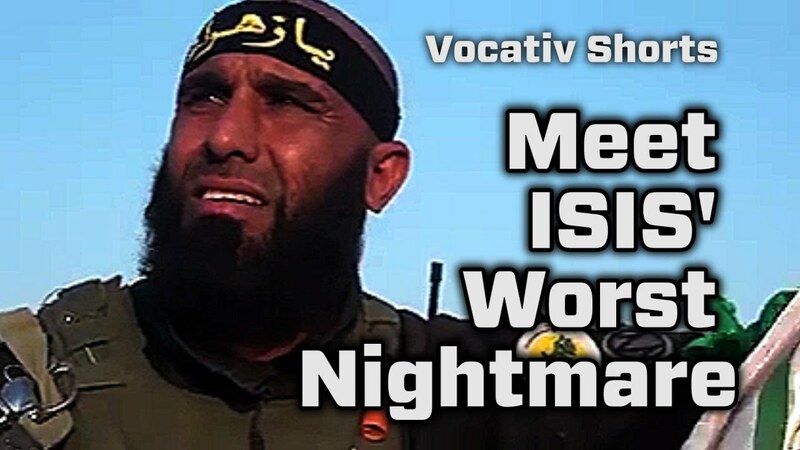 Footage released online shows fearsome Abu Azrael, one of ISIS’ most feared enemies and a poster boy for Shi’a militias, committed the sickening act as a warning to his enemies. 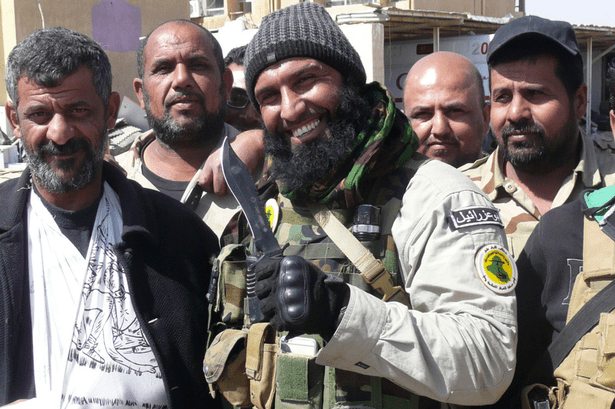 The hulking fighter laughs as he cuts the dead ISIS terrorists leg with a curved sword, then turns to the camera and says: “ISIS this will be your fate, we will cut you like shawarma (a method of grilling meat on a spit and then shaving it off)”. The footage was reportedly taken in the Iraqi city of Baiji. Azrael is a commander with the the Imam Ali brigade, an Iraqi Shi’a militia group sponsored by Iran. He is believed to be a 40-year-old former university lecturer who left his home to fight ISIS last June. Pictures show the bald fighter in his military fatigues, posing with an axe and a heavy machine gun. His mercilessness – combined with a grim sense of humour – has gained him thousands of fans on social media, as well as the ominous nickname ‘Abu Azrael’. He wields an axe, a sword and an assault rifle and told news agency AFP that he has been a soldier for a long time, having battled US forces during the invasion of Iraq. The father-of-five added: “You see me go to school to drop off my children and I am peaceful. The militia he fights for uses pictures and video of him to gain support on social media. He has been photographed jauntily riding a bike, reportedly in an area of intense fighting, while another still shows him grinning, arm casually draped across the cannon of an attack helicopter. One video shows him mocking ISIS fighters with their own walkie-talkie, most likely taken from a dead soldier. Al-Alam, a state owned Arabic-language TV station in Iran, reported that he used to be a university PE teacher. However, the BBC, citing sources in the country, reported that he is actually a highly-trained special forces veteran. Ayyub Faleh al-Rubaie, known by his nom de guerre Abu Azrael (Arabic: ابو عزرائيل‎, literally “Father of Azrael“), also known as the “Angel of Death”, is a commander of the Kataib al-Imam Ali, an Iraqi Shi’a militia group of the Popular Mobilization Forces that is fighting ISIL (Islamic State of Iraq and the Levant) in Iraq. He has become a public icon of resisting ISIL in Iraq with a large following on social media. 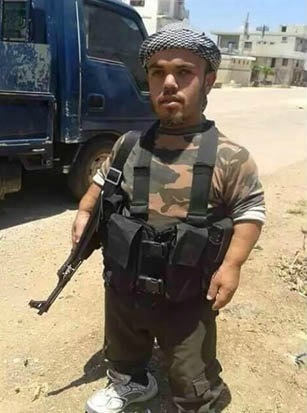 His motto and catchphrase is “illa tahin” (إلا طحين), meaning “[nothing remains] but flour”, that is, he would pulverize ISIL militants until nothing remains of them but powder. He was a former militia member in Muqtada al-Sadr‘s Mahdi Army. 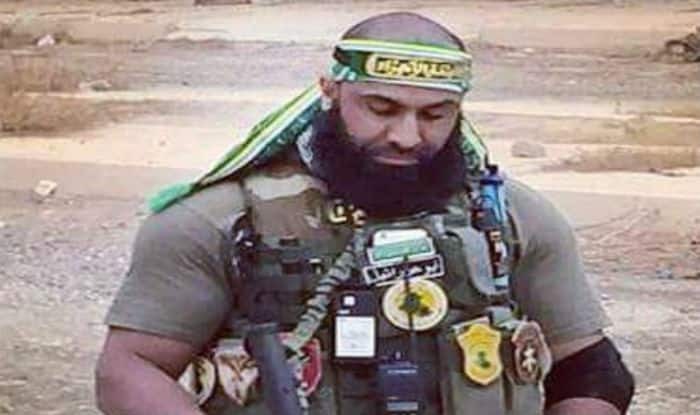 Abu Azrael is described in various sources as a 40 year old former university lecturer and a one-time Taekwondo champion, although other sources dispute that and suggest that this back-story may be fabricated. Reports from March 2015 claimed that Azrael is a father of five, and lives an “ordinary life” when not on the battlefield. Abu Azrael has become a public icon of resistance against the Islamic State, although he has also fought against other militant groups. A Facebook page dedicated to him has over 300,000 likes as of March 2015. He has attracted attention in the middle east, but by the Spring of 2015, he had also made front-page appearances on international news websites in England, France and the United States. He has become a popular public figure, some believe, because his methods and appearance match the brutality associated with the Islamic State (ISIS). For example, he has been shown wielding both axes and swords, in addition to modern military rifles. Moreover, some say that his being a private citizen, his bald head, and his thick black beard give him an aggressive, “dashing” appearance. On 27 August 2015 a video emerged on YouTube showing Abu Azrael burning a Sunni jihadist man alive and cutting into his charred body with a sword.